There are so many things in life that we just don’t know. And so much of our problems aren’t what we don’t know, but what we think we know that isn’t so. Discerning the truth is tough. Sometimes truth comes in rough packages. Sometimes it is so mixed up with other things that separating it out is impossible. Welcome to life at the bottom of the mountain. Welcome to life under the cross. The transfiguration, if we believe the older and wiser Peter from 2nd Peter (the epistle lesson), was a proof of something else – the Word of God. If we are trying to figure out the way from false ways based only on our abilities we might as well quit. As Dante would say “in the middle of my years I came to rest in a dark woods and the true way was lost.” Or as Galadriel would give to Frodo “a light in a dark place”. The Transfiguration with its voice “listen to him” vouches for the firm foundation of the Word. Here, in Christ alone, is our light. And it is not a light meant only for the mountaintop. It is a light that is meant to be used at the base. The light in a dark place. Worship Note: I wish I could have left in the choir, but the recording just didn’t work. (When the men have the strongest line, they get blocked from the main mic. I really need to get the loft mic’d better.) What I did leave in was our opening hymn. LSB 416, Swiftly Pass the Clouds of Glory. I believe I’ve extolled this hymn before. It is a modern hymn both in its text and the tune, and it is one that deserves to claim its place in the hymnody of the church. It captures poetically the main themes of the the Transfiguration. Glory’s brilliance, yet the move to go down. The surety of revelation, yet the preeminence of faith. The need for our transfiguration passing through the dark place with only the light of Christ. We’ve been reading the Sermon on the Mount for most of the Epiphany season. 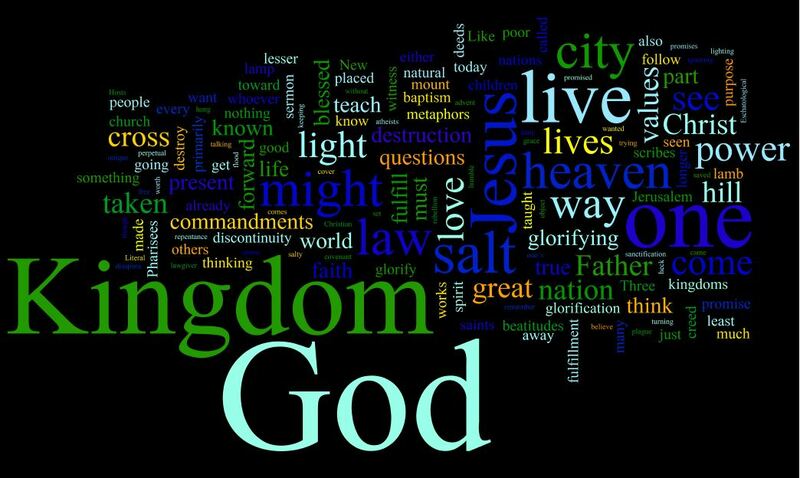 The beatitudes as the entry; salt, light and a city on a hill as the purpose; you have heard, but I say as the doctrinal basis of the Kingdom. We’ve said that the Sermon functioned as a catechism for the early church. The one thing that Luther’s catechism could be faulted for – even recognized by the earliest Lutherans who attached the table of duties – is that is almost completely an expression of the faith which is believed (fides quae creditur) and ignores the practices of the faith which believes (fides qua). Jesus doesn’t neglect that in his sermon. That is why I extended the lectionary reading. Following his authoritative teaching of the 10 commandments, Jesus takes up charity/almsgiving, prayer and fasting. These are piety practices. Using Jesus words, how we practice righteousness. The interesting thing about Jesus’ teaching is how free it is. He doesn’t mandate or limit piety practices. He assumes that we will have them and that they are necessary, but that we will live our own faith. What he is concerned about is that our piety practices are done with the correct heart. He is concerned that we do them to be connected to the Father instead of desiring the reaction of our neighbors. This is the difference between true piety and virtue signaling. Develop the first and you Father who sees in secret will reward; do the latter and you have received your reward. 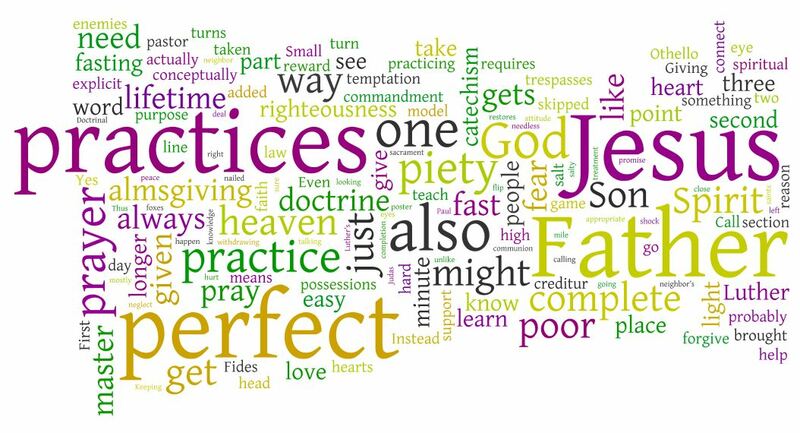 The last movement of the sermon is to examine how the phrase that ends the doctrinal section “be perfect as your Father in Heaven is perfect” is fulfilled in Christ, and grows in us. The doctrine of the church can be summarized in a few minutes, the living of it takes a lifetime to master. And even then it is not us, but God who brings it to completion. Worship Note: I have left in the recording two musical pieces. First between the OT and the Epistle readings our Choir sings a gorgeous piece. (I really need to get a better mic aimed there instead of simply ambient. I did raise the volume level slightly to compensate.) Then I left in our closing hymn, LSB 848, Lord, Whose Love through Humble Service which captures well I believe the force of the text. If we capture the vision of the doctrine taught, it empowers our lives. It also has one of the great tunes in the hymnal which is almost pure Americana from The Sacred Harp. If the American church adds nothing to the eschatological choir beyond these tunes, it will still have added something worthy. We continue reading the sermon on the mount today. The Sermon starts with a very quick recap of the past two weeks before turning to the text. At a very basic level Jesus re-ups the 10 Commandments as part of the law that not a jot of tittle will disappear from. While this section of the Sermon on the Mount could be used as case law, Jesus’ purpose is really beyond just looking references. Instead what he is doing is demonstrating what we tend to do with the law, and telling us what we should be doing with it. We tend to look for an easy way to externally keep the law. We want the recognition for keeping it without the actual work (virtue signaling). What Jesus says back is that the external matters little, what he desires is that we attempt to keep the spirit, the internalized law. The real definition of privilege as that term is used today is the extent to which we can claim to keep the law while relaxing its claims on us individually. Part of keeping the law inwardly, is being willing to be scandalized over our own behavior. 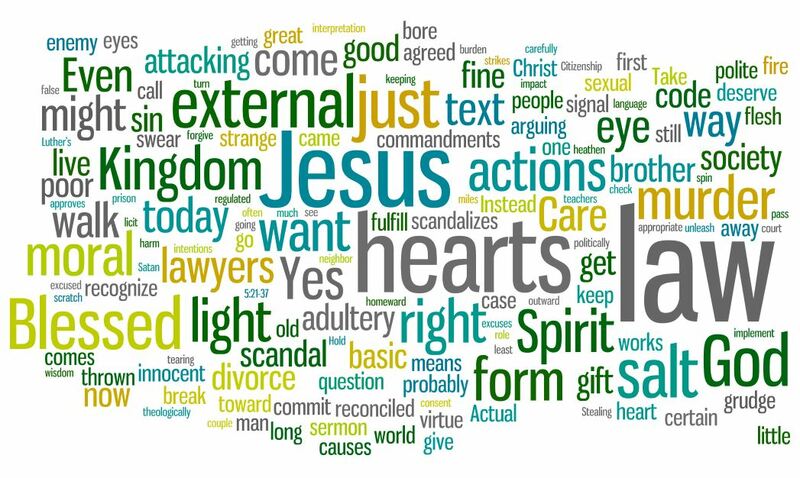 Hearts of flesh contrary to hearts of stone are able to feel the effects of sin, know where it leads, and be willing to make personal changes and sacrifices to avoid scandalizing our hearts, and not just to avoid scandalizing the neighbors. Worship Notes: I have left in one of my favorite hymns, LSB 716, I Walk in Danger All the Way. This is the opening hymn of my funeral right now. The text and the tune mesh together perfectly. It is the rare example of the slow burn hymn. The open verse states a true problem, and things get worse from there, but there is no immediate delivery or magic as so often happens. It doesn’t deny the reality of this world, but it develops over the last three verses our solid hope both here and for eternity. Powerful text if you let yourself hear. The second item is that you might hear a missing note. Our organ decided to drop a note this morning. Providentially, we have a new organ on the way. The lectionary continues reading through the sermon on the mount. For me the best way to read it is as what it was to the early church, a catechism on the Christian life. In these verses Jesus addresses a couple of questions. The first is a rare instance of a why question being answered by God. The second is what is the relationship between the messianic Kingdom and the old covenant contained in the law and prophets? The two answers feed into each other. As it turns out the old covenant maintains an honored role. This homily explores those answers and the role of the law in the life of the Christian. Worship note: The Hymn of the Day supporting that theme is LSB 579, The Law of God is Good and Wise. It is a great example of a Lutheran Catechetical hymn. It teaches the three uses of the law, the important powerlessness of that law, and as with the Gospel text the fulfillment of that good and wise law. The law has become something of a four letter word in many churches. The more you read both Jesus himself and the church from different ages you realize how wrong that is.